Touted as the tablet that has it all, the Microsoft Surface Pro 2 ($899; 128GB) has the power of a laptop and the portability of a tablet that makes it the ultimate traveling companion. It also easily adheres to the lifestyle of the person who is constantly on-the-go. 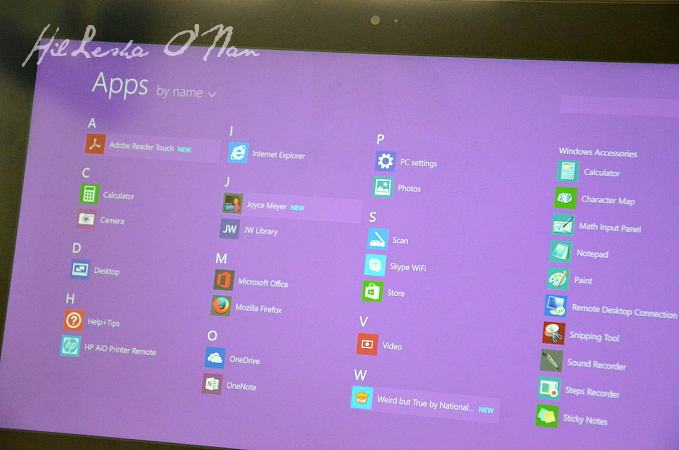 Since the Microsoft Surface Pro 2 runs on Windows 8.1, you can be rest assured that you won’t be leaving your necessary information, such as documents, pictures, bookmarks, and browser history at home, as you can sync it with your Windows smart phone, or anything that runs on Windows, whether it’s your desktop or laptop. This feature alone, has saved me on many occasions! 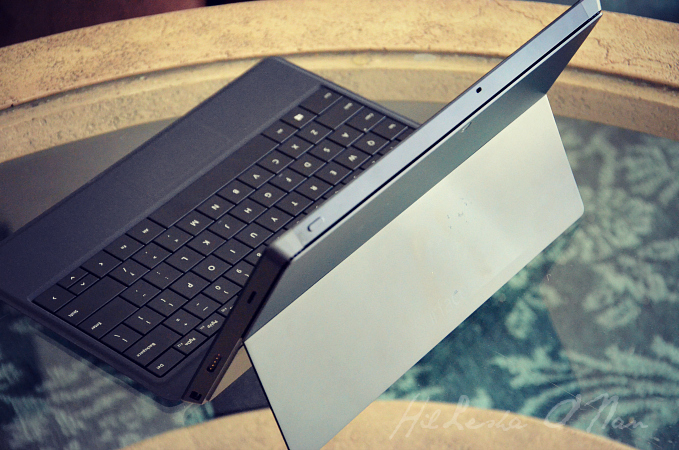 The built-in kickstand, along with the keyboard (sold separately; $129.99), gives the tablet the look and feel of a laptop. The pre-installed apps, such as the calculator and camera, always comes in handy. 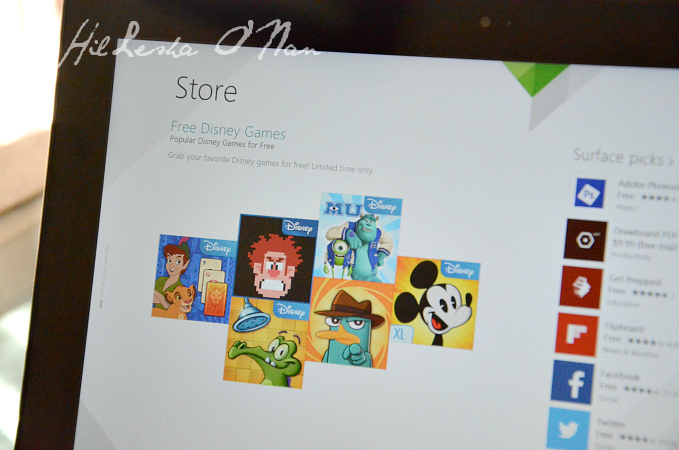 However, you can easily install other apps that suit your lifestyle, which can be found within the Windows “Store” app. Of course, there are some apps that come at a price. However, that’s not the case for all of the apps. There are several Disney games (Disney Solitaire, Maleficent Free Fall, Frozen Free Fall, Hidden Worlds, and Where’s My Water?) that are completely free! 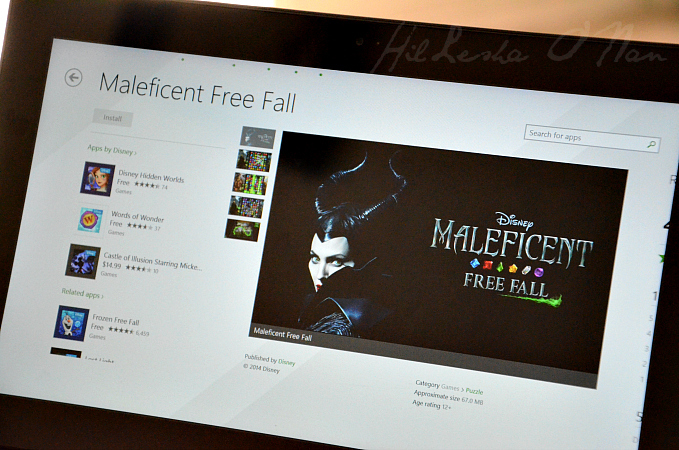 Out of all of the gaming apps, the Maleficent Free Fall is my absolutely favorite! I quickly fell in love with this game about a couple months ago when I got my new Android smartphone. Therefore, I was pleasantly surprised and delighted when I saw that it was listed as one of the free games in the Windows Store. It’s the perfect game to nix boredom when traveling, whether you’re waiting at the airport, on plane, or in the car. It’s sort of like Bejeweled, but with a twist! The sheer beauty of the Microsoft Surface Pro 2 is that I can convert my “miniature laptop” back into a tablet by removing the keyboard in a snap. Some may feel like the Click-In Keyboard isn’t a necessity since the tablet has an on-screen “keyboard”, but the Click-In Keyboards are more than just keyboards. 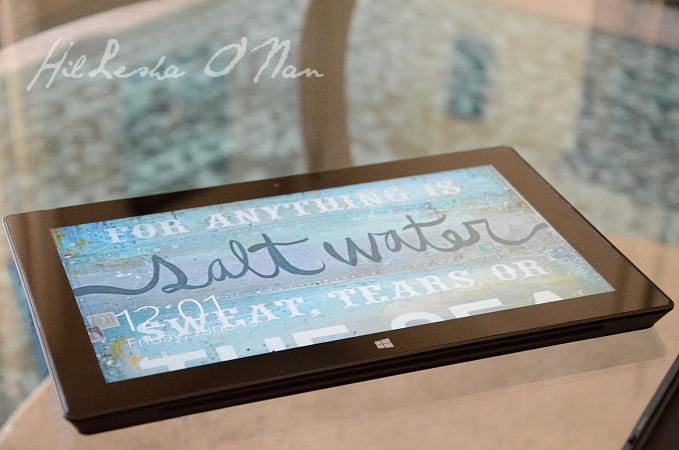 They act as Surface Covers, protecting your tablet once you’re finished with it. The Keyboards/Surface Covers are thin, lightweight, and come in vibrant, bold hues (Magenta, Cyan, Purple, or Charcoal) to fit your style personality. 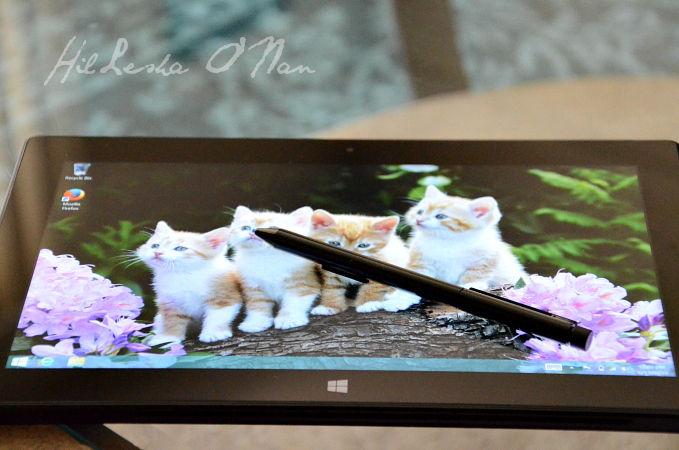 The Microsoft Surface Pro 2 comes with a stylus pen that you can use with applications, such as OneNote, to take notes or draw. You can also use it for PDFs, PowerPoint presentations, and documents just like you would on paper. This tablet has so many wonderful features! A couple years ago, I bought a Lenovo laptop that I use primarily for work. However, there are things about this tablet that gives my laptop a run for its money! Cliché, as it may sound, but the sound quality and images are so crisp and clear that the experience of seeing it up close and in person conveys a phenomenality that is indescribable. Purchasing the Surface Pro 2 boasts two noteworthy perks: 200GB of OneDrive storage for 2 years and free voice calling to land lines in over 60 countries and Skype WiFi for 1 year. #spon: I’m required to disclose a relationship between our site and Intel. This could include Intel providing us with content, product, access or other forms of payment. I’m totally convinced. I want one! What a great idea! I have to go and check this out. I love that you can convert it to a tablet. Kathy recently posted..Join us for the #ShareItForward Twitter Party July 3rd! I would so love to get one of these for my son he needs a laptop and I love that it can become a tablet too. I totally love tablets for watching movies and doing my social media! wow! I’ve been looking into laptop options, and this looks like an option I need to explore. Never thought of a tablet! We have been looking for a new laptop and this really looks like the perfect combination for us. We are convinced! That’s super cool that the keyboard also doubles as a cover. I have a Bluetooth keyboard for my current tablet and always struggle with where to stash it when I’m not using it. 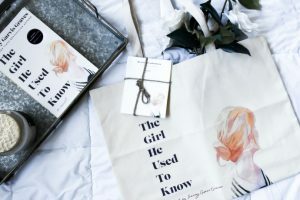 Jen – Life With Levi recently posted..Can we please stop over-simplifying marriage already? I have the first generation of this one – loved it. The only thing I didnt like was that if you do not have the stand out – it does get really hot. But I love having Windows8 on it! Great tablet! 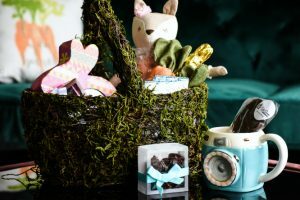 Lynsey @MoscatoMom recently posted..Toasted Marshmallow Chocolate Milkshake – With Peeps Minis! This looks like an awesome tablet to get. I love all the features it offers. My husband is longing for a surface to be able to do on the go Lightroom editing of pictures! I got the Surface RT when it first came out. You have me thinking it’s time for an upgrade! Yes, love mines! It’s perfect for everything..
My daughter wants to buy one of these, I’ll have to share your post with her! Gosh, I tootally want one so badly!! WOW! It looks amazing! I have been wanting one. I’m happy to see some high-quality apps are also free. Looks like a great little computer. I need a new one, so I’ll check this out. 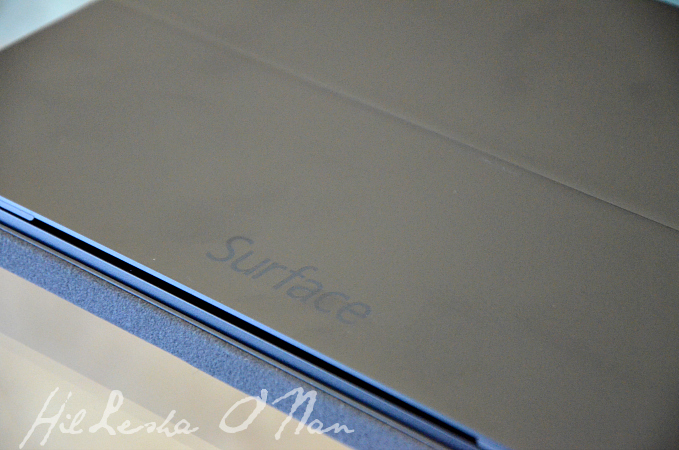 I love my Mac with all my heart but I’d be lying if I didn’t say that the Surface Pro 2 is pretty dang persuasive! I love the detachable keyboard. That looks pretty neat, I have an iPad that I use. It looks like it has a nice good quality screen, which a lot of tablets don’t! I really like the ease of conversion on this!! This would be so handy. I like the stylus! Reminds me of the Palm Pilot from back in the day (gosh I wanted one of those LOL). 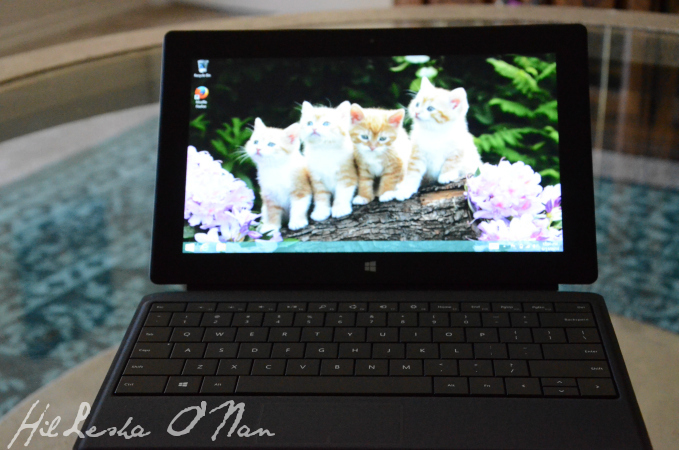 The fact that this has windows on it is what I like the most (well…after the stylus)! I love this tablet! I like the built in kickstand. I’d love to have one of these. It is so much more portable than my bulky laptop. I’m at a conference right now and could totally use one of those. 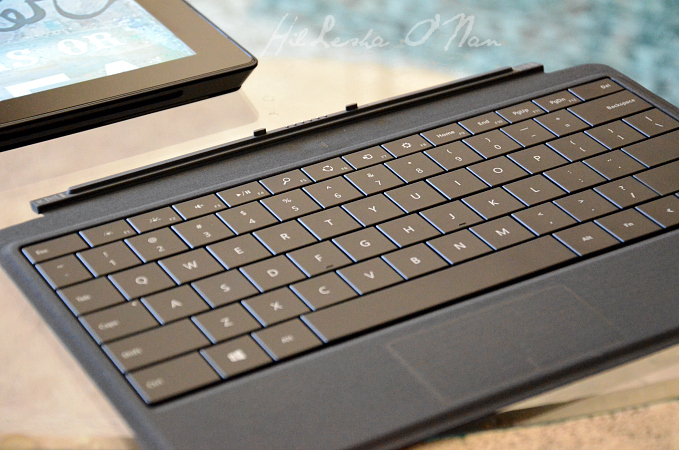 My husband wants a surface tablet. It’s hard to tell if it is a good fit without actually trying it – but it sure looks amazing! I like the portability of this and the fact that you can add a keyboard. I would love one of these to replace my laptop. Unfortunately with our daughter going to college in fall and the fact she’ll need a new laptop for that purpose, it just isn’t in the budget for me right now. Looks like an amazing tablet, I have hear nothing but good things about this product. Yes, I love traveling with mine! It gets the job done. Oh my goodness I can’t even tell you how much I want that. I work on a desktop computer but I would love to be able to work from anywhere, even if that’s just my couch! Shell Feis recently posted..5 Tips for Getting âDate Nightâ Hair Every Day! This looks so very handy for both using at home and on the go. I have been eying these for a bit now. Rachel recently posted..Happy Summer! What’s on your warm weather agenda?